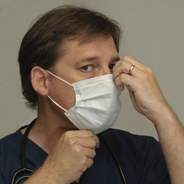 Trying to find a way to greet your patients but limit the spread of cold and flu? 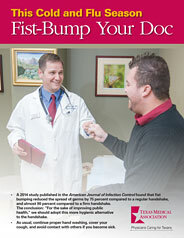 Citing a recent study published in the American Journal of Infection Control, TMA member Jason Marchetti, MD, has your answer! A physical medicine and rehab physician from Denton, Dr. Marchetti remarks, “This has all of the qualities of an ideal medical intervention: it’s free, it’s safe and it can be done easily by everyone.” Posters in English and Spanish and various sizes are available. TMA is helping to strengthen your practice by offering personal advice and creating a climate of medical success across the state. Got Flu questions? Call or email the Knowledge Center.